For the younger generations of Chinese, some of the traditions and customs during pre-wedding day and wedding day may have been forgotten or replaced by the modern way of simplicity. As for some older generations who would like to upkeep and preserve the tradition, they may somehow face difficulties in sourcing items for the two family’s gift exchange custom as most of these items would have been long gone through modernization. On top of the normal “lai see” (利是-red enveloped gifts in form of money or jewelries) and/or a roasted pig, a few other items would include certain type of biscuits and cakes. Not many bakery and confectionary shops in Penang, Malaysian, would produce them today. Luckily, the newer generation of Penang’s traditional biscuits maker, Leong Chee Kee Biscuits, had decided to carry on with the tradition with the production of the traditional wedding biscuits and cakes. Mr. Leong How Keng (梁考京先生), 53 years old, has been learning from his deceased father, Leong Chee Kee as early as 7 years old, mastering the skills and techniques to make great tasting products. He had even improvised on certain of his products to suit the taste bud of today’s generation. Two of the uncommonly produced items (unless there are orders for a wedding) would be the Yellow Bridal Biscuits (黃綾蓮蓉酥) with lotus seed paste filling and the Red Bridal Biscuits (紅綾黑豆沙酥) with red bean paste filling. Both would have the Twin Happiness Chinese character “囍” printed on them. Each biscuit would cost RM2.20. Normally, 5 pieces of each color would be packed in a box with the Twin Happiness Chinese character printed on it. 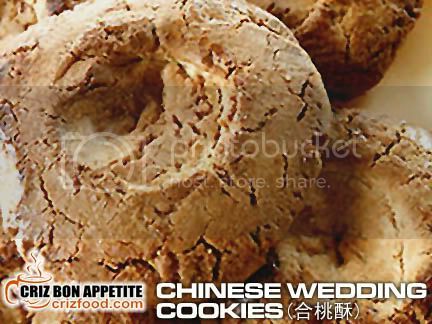 Another one of the gift exchange biscuits would be the Chinese Wedding Cookies (合桃酥-RM2.20). It looked like a rock biscuit but the taste of a buttery shortbread cookie. There are many variants to this cookie all over the world. Some may use almonds, walnuts, pine nuts with or without topping. Leong Chee Kee Biscuits only produced the plain ones with the use of flour, sugar and butter. You would expect to get a 5 pieces pack from them. The next and last of the wedding requisite would be the Egg Cake (特大瓜子雞蛋糕-RM2.20). The Egg Cake would come in a floral shape with lots of pumpkin seeds sprinkled on top. This would also come in a pack of 5 pieces. In olden China, most of the Chinese community (except the Hokkien and Teochew) would purchase at least two out of the four items stated above for the inter-family gift exchange. The quantity given from the groom’s family to the bride’s family can vary depending on the financial stability of the groom’s family. It may also be based on the requirement of the bride’s family for the purpose of religious praying on the altars or as gifts to their relatives and friends. The quantity may range from a minimum of 50 pieces each of the items to as many as a few hundreds. 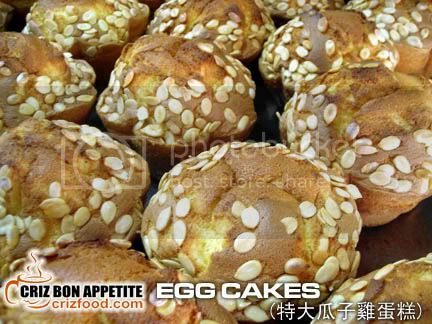 Here are the processes of producing the plain and pumpkin seed egg cakes that might interest you. Both of the eggs cakes were made from the same ingredients (flour, eggs & sugar) except they were baked in different shaped moulds with the options of adding in pumpkin seeds. Other than being famous for the wedding biscuits and cakes stated above, Leong Chee Kee Biscuits is also famous for its Coconut Tarts (椰餅-RM1 each). 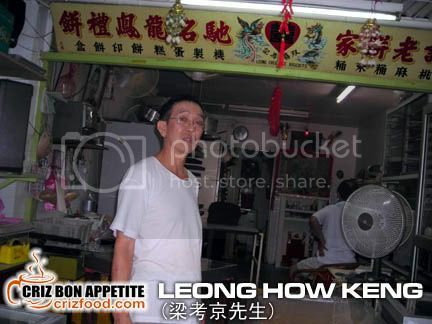 With Mr. Leong as the sole baker, the shop would only produce 300 pieces of the tart daily. To avoid disappointment of not having to try out the delicious coconut tarts for the day, booking has to be made in person as early as 9.00am as telephone orders would not be entertained. The Coconut Tart was indeed delicious as the sugared grated coconut filling has the fresh and natural fragrance. Moreover, the base has the layered texture and the twirl effect of the tart surface required hours of preparation. Each set of the coconut tarts has to be baked twice for that extra taste. 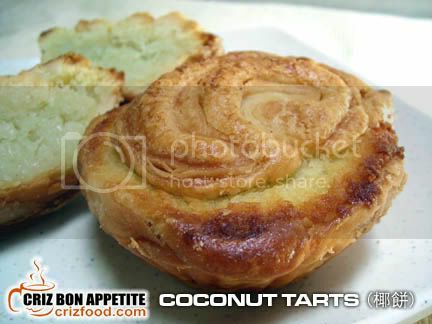 The coconut tarts would be great takeaway gifts for friends and family. There’s a secret to maintain the freshness and crunchiness of the tarts… They have to be kept in the chiller prior to eating. As there were no added preservatives, a tart would stay fresh for 5 days or more. There are also many other types of biscuits and cookies available for you to takeaway. Some of them are as shown in the animated photos below. The more established one would be the Pepper Biscuits (胡椒餅). 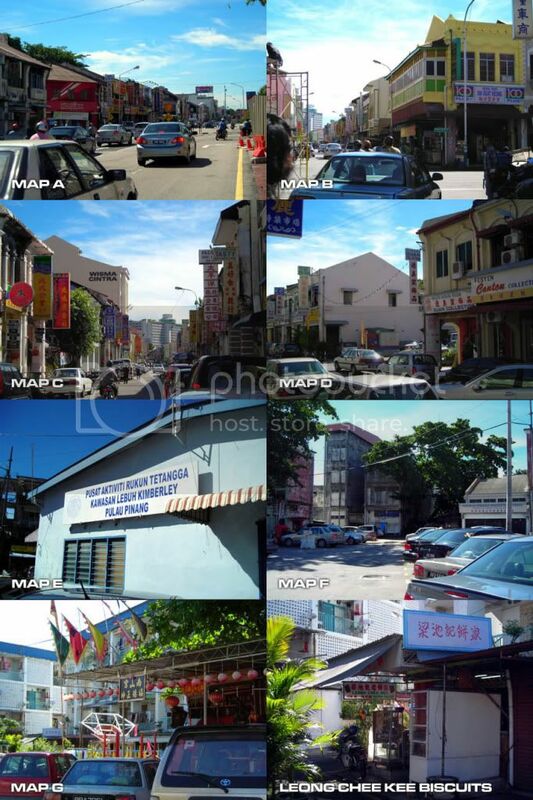 Most people especially those from outstation would get lost trying to locate the shop. I will provide some easy to spot landmarks to direct you to the shop. Firstly, try to drive into Jalan Dr. Lim Chwee Leong and you will see a divider with two arrows (MAP A -straight to Weld Quay and right to Komtar/Prangin Mall). Watch out for the red telecommunication shop on your left and turn into the road (Jalan Sungai Ujong). Drive straight until you have reached a junction (MAP B – Jalan Sungai Ujong/Jalan Kimberley). Drive across Jalan Kimberly into Lebuh Cintra. 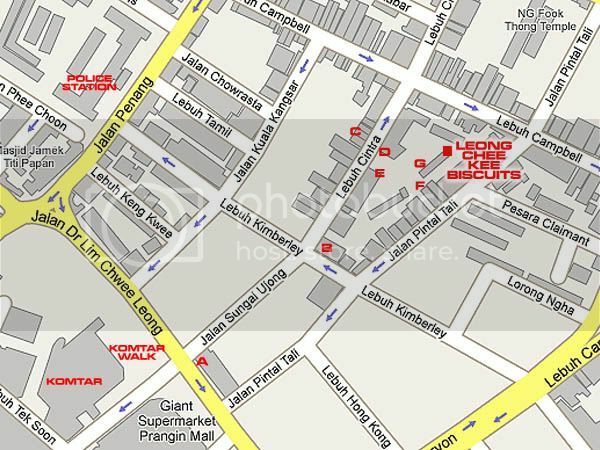 Watch out for the tall building with the word Wisma Cintra (MAP C). Slow down and keep a watch out for a small lane on your right before Kedai Nasi Ayam Wen Chang (MAP D). Turn right into the lane and you would see a light blue Rukun Tetangga building on your right (MAP E) and People’s Court Association straight ahead (MAP F). Park your car here and you will see a small shrine on your left (MAP G). Walk up to the shrine and towards the end of the row of shop houses and you would see the Leong Chee Kee Biscuits shop (梁池記餅家). Another great place for traditional biscuits, cookies and cakes would be a shop handled by some elderly folks along Lebuh Carnarvon by the name of Guangzhou Cake House. 8-C, People’s Court, Lebuh Campbell, 10100 Penang, Malaysia. Oh, they have wedding cookies too!!! Good!!! Thanks for sharing! They do not produce them often. It will depend on your luck to try them. Haha… sorry to say but they are closed on Sunday. This is so new and interesting to me… I’ve never heard about wedding biscuits and traditional wedding cakes before. Well, I only know a little bit of the tradition like eating those glutinous rice soup and tea drinking during the wedding ceremony. haha i’ve never even heard about wedding biscuits too!!! obviously never used them in my wedding!!! Their pepper biscuit is to die for !!!! I have been munching those ever since I’m a kid.. LOL!